Have you ever heard the words, I love you, become I love you…BUT? Has anyone ever left you; a friend, spouse, or a loved one? Unfortunately in life friends and loved ones will leave us or no longer wish to be a part of our life. Love as defined in the human expression varies. Love is a tremendous feeling; unfortunately we have all had someone separate us from something we love in life. We are reminded of that sick feeling in the pit of our stomachs that accompanies such a separation and the feelings of loneliness and heartbreak that seem to penetrate every part of our existence. Our love is not only conditional, it is changes with circumstances. We love based on feelings and emotions that can change from one moment to the next. The divorce rate is extremely high in today’s society because husbands and wives supposedly stop loving one another-or they “fall out of love”. They may go through a rough patch in their marriage, and they no longer “feel” love for their spouse, so they call it quits. Evidently, their marriage vow of “till death do us part” means they can part at the death of their love for their spouse rather than at their physical death. The human definition of love is many times, selfish and self-serving, a far cry from what God intended love to be. This kind of love leads many a marriage to divorce which is contrary to God’s word, and His desire for us. Marriage is a holy union, ordained by God. We know by God’s word that marriage was designed, intended, and instituted by Almighty God to be a permanent, never-to-be-broken, covenant relationship which God intended to bind a husband and wife together for as long as they both shall live. A man and woman before God vow to each other and also to our families and their community to remain steadfast in our love, sexual purity, and mutual commitment to each other for as long as they both shall live. They commit themselves to continually endeavor to nurture and grow their covenant marriage relationship throughout all the days of their life together. But when conflicts arise and there is a threat of separation, we are easily moved that our so-called “love relationships” are actually of true love. So what is love? Moreover, what is true love? Is there real love connection involved with what we call falling in love? And what about the dreams of this somewhat crazy love: loving and being “truly, madly, deeply” loved forever, – does it exist in reality? Can true love be severed or separated? Wow, what a comfort, what a blessing, what joy there is in the love from our Lord to know that no hardships, troubles, lack of finances, nothing we can ever experience no matter how hard, trying or terrible things get, nothing can separate us from the love of God. No hardship or distress we might encounter in life can be so overwhelming that Gods love for you does not increase as what you are going through intensifies. At these moments His love grows strong. Such is not the human condition. There is no pain in life so powerful that Gods love does not bring you comfort. In life there may be times when you are hungry, but you will never hunger for lack of the Father’s love. In life sometimes we are abandoned by those we love as financial dire circumstances beset us. But poverty or lack of finances cannot rob you of God’s compassion, just as even death itself is not capable of robbing us of our Father’s infinite love. In life many times our love is dictated by the circumstances we find ourselves in, but we cannot base our view of God’s love on our circumstances. Have you ever said to yourself, “If God loves me how could He allow this to happen to me”? At times in life we sometimes question what we clearly read in God’s word concerning His love for us. 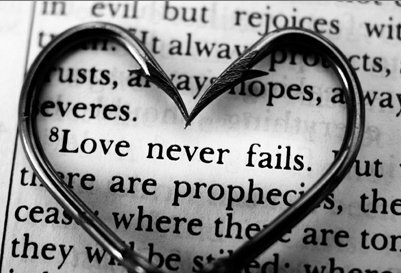 God states that and promises that we will never be separated from His endless love. He does not say that we will never encounter hardship, suffering, heartbreak, poverty, trials or sadness. If you find yourself doubting the love of God because you find yourself facing difficult times in life, you need only to look at the life our Jesus to see God’s love for you. If you can allow the death of Christ on the cross to embrace your heart and settle in the depths of your soul, any doubt you might have about God’s love for you can be settled. You can confidently face any hardship in your life. Just realize that God is not like man and is not moved by hardship or dire circumstances, and know that there will never be anything that can separate us from God’s perfect love. This removes fear and releases the love of God in your life and He is able to express His love for you no matter how hard the situation you are in is. Always remember the love of God is not to be understood or measured from the human experience, so do not view God’s love based on your circumstances, instead see you circumstances from the perspective of God’ love for you. God is Love, and His love is very different from human love. God’s love is unconditional, and it’s not based on feelings or emotions. He doesn’t love us because we’re lovable or because we make Him feel good; He loves us because He is love. He created us to have a loving relationship with Him, and He sacrificed His own Son, who also willingly died for us so that we might know His love. ‹ Husbands… Do You Have a Love Language? We do enjoy your writing and certainly these posts have helped us very much as we trudge the road of life together. no matter where ur love is……..
God is Love and I really love him even in the bad times he carries my. i agree…for humans to experience true love we must try to learn to love like him.. den….true love.. goes beyond death of the physical body and also the death of the ever changing feelings n emotions.To me Jesus will always be the biggest romance of my life..the greatest n bestest of all lovers……n i wanna be like him…always!